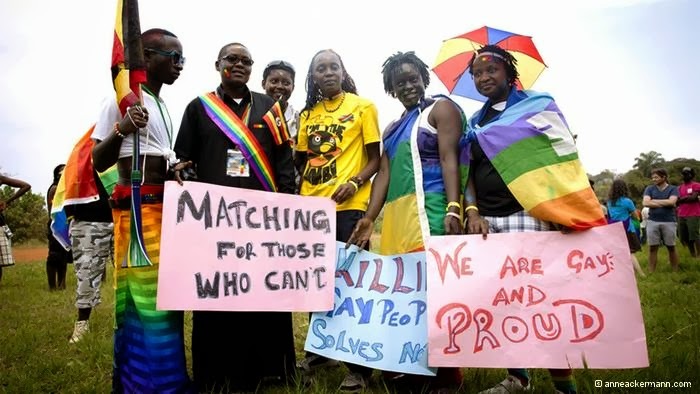 After signing the bill criminalizing homosexual behavior, the Uganda president is quoted, "This law was provoked by arrogant and careless Western-based groups that are fond of coming into our schools to recruit our young children," he said in a televised speech shortly after signing the bill. "Can somebody be homosexual purely by nature without nurture? The answer is: 'No.' "
He certainly seems to have failed to get the message about "born that way", doesn't he? If that line don't fetch them, I don't know "gay" activism! Somewhat ironic to see news media pictures of protest signs. Uganda reportedly has a high literacy rate of about 2/3. The signs are obvioulsy intended to be read by others, not Ugandans.